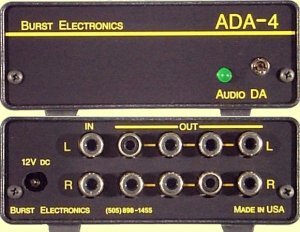 The ADA-4 is a stereo in, four output audio distribution amplifier. The ADA-4B is the balanced audio version. These units use the latest in high speed, monolithic operational amplifier technology. This results in wide bandwidth, low noise and low distortion. All units contain internal regulated bipolar power supplies and are powered by external 12 Vdc, perfect for field or studio applications. Each of the four outputs is a separate buffer amplifier resulting in a high degree of isolation between outputs.